The Dental Specialty Assessment and Training Program (DSATP) is open to applicants who are graduates of non-accredited dental specialty programs. The DSATP, commonly known as GAP training, assesses a candidate’s didactic and clinical knowledge, skill and judgement in their specialty area and identifies area(s) that require additional training. For a prospective applicant to be admitted to the DSATP the required training to address knowledge and/or skill deficiencies must be completed in less than 12 months. Upon successful completion of the program The Faculty of Dentistry will provide a certificate of completion to the applicant and forward a letter to the Royal College of Dentists of Canada confirming successful completion of their DSATP program. 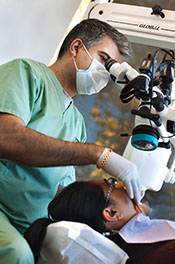 Candidates will then be eligible to apply to write the National Dental Specialty Examination (NDSE) administered by the Royal College of Dentists of Canada. Please note: DSATP training in all specialties may not be offered in a given academic year. The Faculty will provide as much notice to potential applicants. Please check this website frequently.